The My Lai Massacre, and the Lafayette man who changed our ideas about warfare. He had good reason to abuse some kind of drug. The picture at top right is disturbing. The locals here have just been rounded up by US soldiers. The woman adjusting her blouse is really a 13 year-old girl. She seems calm, but in reality she is dazed. She has just been sexually assaulted, but the soldier molesting her stopped when the photographer walked up. After the photographer snapped this picture, he walked away to the sounds of gunfire, and all of these people were executed. The toddler, the screaming girl, the stunned girl, the child hiding behind her, the old couple, they were dead. Below left is a picture of the the aftermath in the same military action. Click on it for a larger view, and look at it carefully. You can see several babies among the dead women; note the dead child at the top edge of the picture. There is another reason that this scene is unusual which is not immediately obvious. There are no soldiers among the dead. There are no men at all. Although one source I read estimated almost 200 children under the age of 2 were killed here, in all of the deaths there was not one man of military age. Their absence from the scene is significant to the horror. It is also significant for the decision that initiated the slaughter. These are pictures of Son My, a hamlet that was part of the village of My Lai, in Viet Nam. On the morning of March 16, 1968, the US Army launched Task Force Barker. 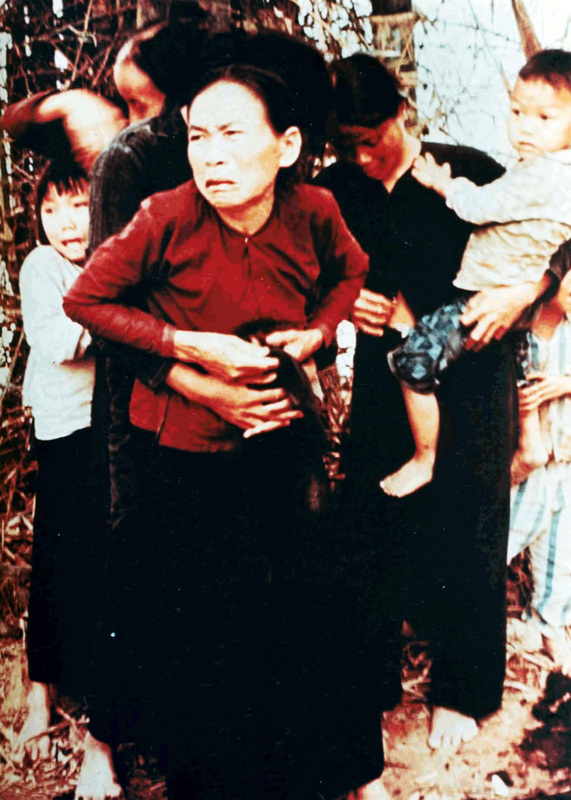 This was the result, the My Lai Massacre. And for at least some of the chain of command, this was the intent. I have noted previously that since WWII, military action against the US has moved toward guerrilla action. Part of this is because since the surrender of Japan there has been a sharp decline in conflicts between major powers, and therefore a decline in traditional warfare. And there have been no wars between any two modern democracies since then. But probably the larger explanation is, it works. The advanced countries don’t yet have a good solution for responding to guerrilla forces, although the Petraeus/Nagl doctrine is beginning to develop promising tools. As I noted, there were no men of military age in the My Lai massacre. So where were they? The US military was fairly certain that they were guerrilla fighters who frequently crept off to fight for the Viet Cong. And so Task Force Barker was launched to deal with the problem, which the officers on the scene interpreted to wipe out everyone there. That sounds horrific, and it is. It is also the reality of warfare, ever since Cain slew Abel. Guerrilla warfare is hardly recent, it is only recently effective. Alexander, Julius Caesar, Napoleon – and oh yes, Hitler – had very effective ways for dealing with guerrillas. And rebels. And dissenters. Wipe them all out. As some American soldiers said during the Viet Nam War, “Kill ’em all and let God sort ’em out.” Look at the casualties from warfare. Civilians have almost always died in greater numbers than combatants. We don’t realize this because throughout history we have glorified warfare, and ignored the realities. Watch a war movie (other than Saving Private Ryan), play a war game. Not much blood or dismemberment. No civilian deaths either, except by rare, regrettable accident. We ignore the necessary, and messy, realities of warfare. Horror, like guerrilla tactics, isn’t recent. It is only recently objectionable. 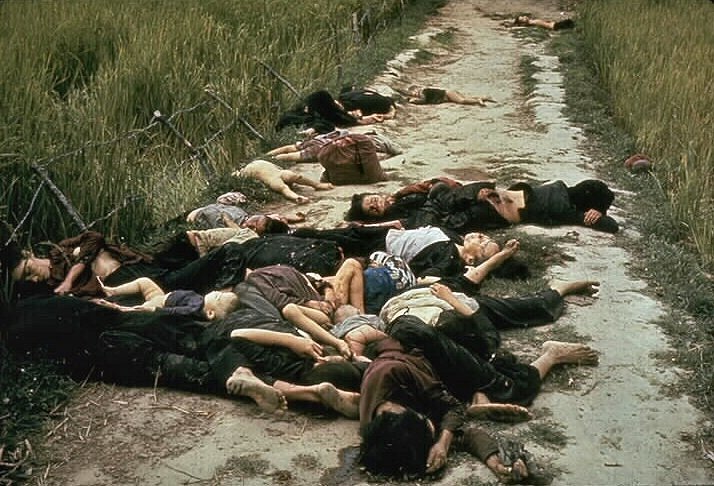 And the pictures you see here of the My Lai massacre are almost certainly the principle reason that guerrilla actions are so effective today. Before these pictures appeared, most Western civilians, particularly in the U.S., had never known what warfare really looks like. We didn’t know, and we didn’t really want to know. For all of us who have fathers and grandfathers and others who will not talk about their war experiences, this is part of the reason. Certainly that includes slaughter of enemy combatants: looking at a dead or dying enemy and realizing that he had the same loves and fears and hopes as dreams as the soldiers who killed him, is bad enough. The civilian deaths are much worse. Even when our troops have tried desperately not to kill civilians, there is always ‘collateral damage.’ There are always dead children, women, and elders. And the drinking man I noted above – and probably because of him, the photographer who took these pictures – are a big reason that our ideas about warfare have changed. My brother was a veteran of the Vietnam “Conflict”. In one way, he was fortunate. He had been drafted and as such was to be assigned to the infantry. Just before his group shipped out, the CO stopped by and asked if anyone wanted to volunteer to be a Medic. My brother volunteered, knowing that it would mean more training before being sent to the war. He spent much of his overseas service working at small bases, not out in the jungle. As such, he was less likely to be wounded than he would have been if he had gone over with his infantry unit. But, as a medic, he saw horrific wounds and deaths caused by the battles, by both military and civilian people; And he certainly saw more than the average soldier saw. He was deeply affected by this, and it haunted him until the day he died. 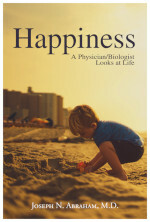 I am certain that it was one of the contributing factors that led to his early death at the far too young age of 53.